Animation drawn by Mike Mills. Animation drawn by Luke Oman. International Campaign to Abolish Nuclear Weapons (ICAN) wins the 2017 Nobel Peace Prize. Read the Nobel Lecture here. Robock, Alan, Luke Oman, and Georgiy L. Stenchikov, 2007b: Nuclear winter revisited with a modern climate model and current nuclear arsenals: Still catastrophic consequences. J. Geophys. Res., 112, D13107, doi:2006JD008235. PDF file Russian translation (по русский) Featured as a Research Highlight in Nature. h3zm.soot.BW.10fps.gif is an animation of the vertical distribution of the smoke as it is spread around the world by the winds. The smoke is heated by absorbing sunlight, lofted into the upper stratosphere, and blown into the Southern Hemisphere. See Powerpoint for this figure with different layers of the atmosphere marked. BCabsoptdaily.gif is an animation of the smoke distribution as it is spread around the world by the winds. The smoke is heated by absorbing sunlight, lofted into the upper stratosphere, and blown into the Southern Hemisphere. Animation drawn by Luke Oman. BCabsopred.gif is the same animation as BCabsoptdaily.gif, but in red. Animation drawn by Luke Oman. BCabsoptdailyheight.gif contains the same animation as BCabsoptdaily.gif, but also includes a graph at the side that shows the vertical distribution of the smoke. Within the first week the smoke in the troposphere, the lowest atmospheric layer, is lofted or washed out, and the remaining smoke is lofted well into the stratosphere, removed from weather where it can remain for years. The black horizontal line at about 150 mb marks the boundary between the troposphere and stratosphere, at about 12 km (7 miles). The top of the stratosphere (at 50 km or 30 miles) has a pressure of about 1 mb. (Updated June 14, 2008, to correct small errors. If you downloaded this before June 14, 2008, please take this new one.) Animation drawn by Luke Oman. BCdaily50tg.gif is an animation of the smoke distribution as it is spread around the world by the winds. The smoke is heated by absorbing sunlight, lofted into the upper stratosphere, and blown into the Southern Hemisphere. Animation drawn by Luke Oman. BCdaily150tg.gif is an animation of the smoke distribution as it is spread around the world by the winds. The smoke is heated by absorbing sunlight, lofted into the upper stratosphere, and blown into the Southern Hemisphere. Animation drawn by Luke Oman. Fig3TempPrecip.jpg Time variation of global average net surface shortwave radiation, surface air temperature, and precipitation changes for the 5 Tg standard case. The global average precipitation in the control case is 3.0 mm/day, so the changes in years 2-4 represent a 9% global average reduction in precipitation. The precipitation recovers faster than the temperature, but both lag the forcing. For comparison the global average net surface shortwave forcing from a model simulation of the 1991 Mt. Pinatubo eruption is shown. By contrast, volcanic particle last for a much shorter time in the atmosphere, as they are not lofted by solar absorption. Figure drawn by Luke Oman. 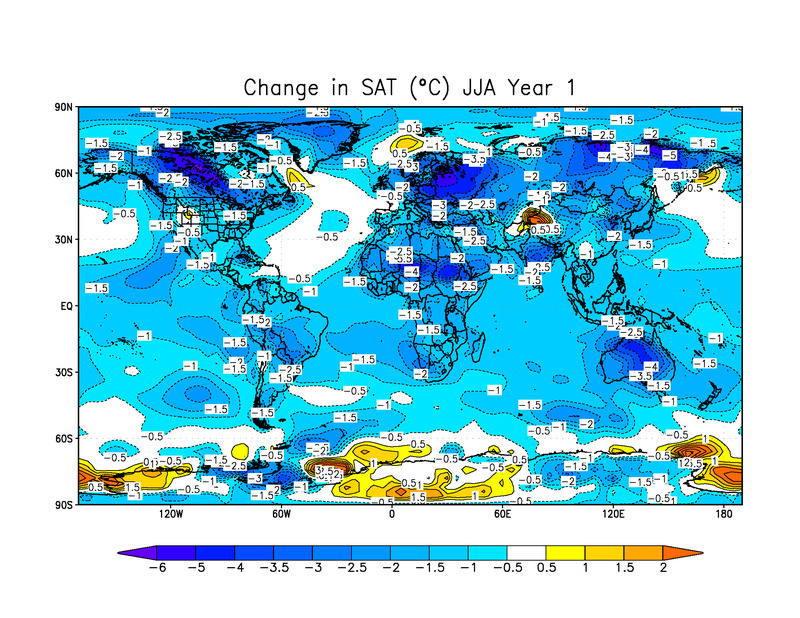 Fig5SummerTempMap.jpg Surface air temperature changes for the 5 Tg standard case averaged for June, July, and August of the first year following the smoke injection. Effects are largest over land, but there is substantial cooling over tropical oceans, too. The warming over Antarctica is for a small area, is part of normal winter interannual variability, and is not significant. Figure drawn by Luke Oman. 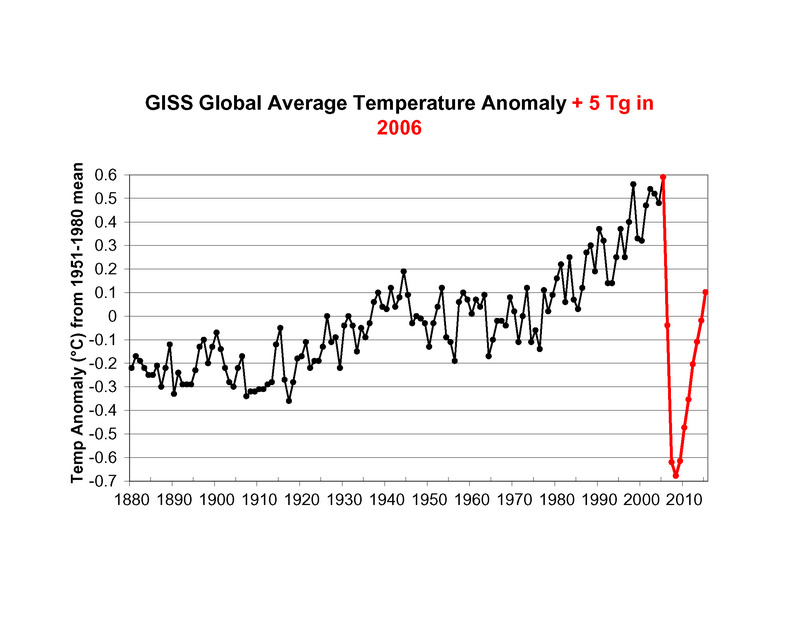 Fig9GISStemperatures.jpg Global average surface air temperature change from the 5 Tg standard case (red) in the context of the climate change of the past 125 years. Observations are from the NASA Goddard Institute for Space Studies analysis (Hansen et al., 2001, updated at http://data.giss.nasa.gov/gistemp/2005/). Figure drawn by Alan Robock. 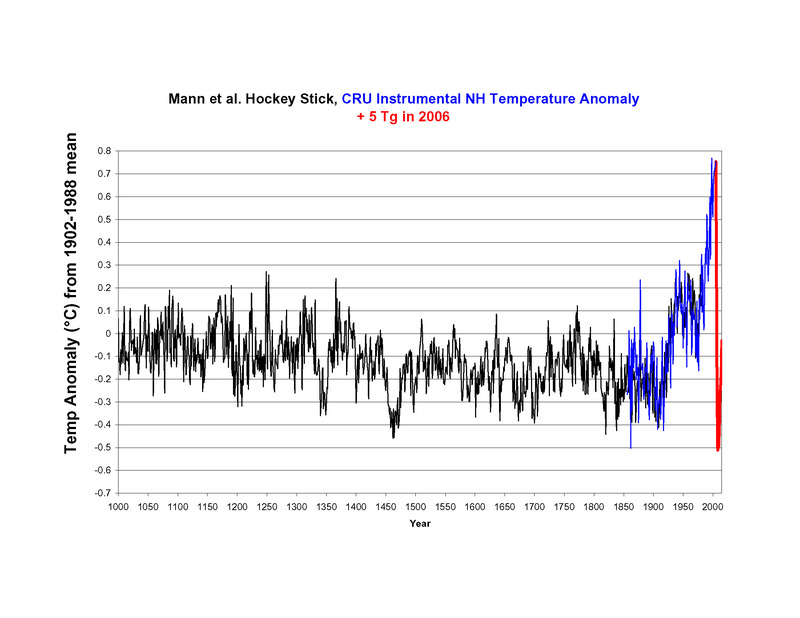 Fig10HockeyStick.jpg Northern Hemisphere average surface air temperature change from 5 Tg standard case (red) in the context of the climate change of the past 1000 years. Black curve is from Mann et al. 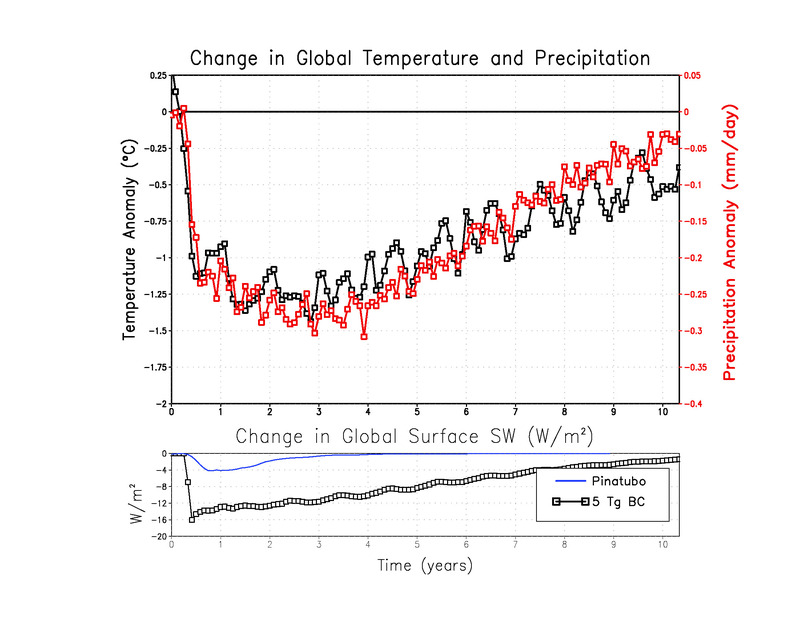 (1999), and the blue curve is from the latest data from the Climatic Research Unit website (http://www.cru.uea.ac.uk/cru/data/temperature/). Figure drawn by Alan Robock. 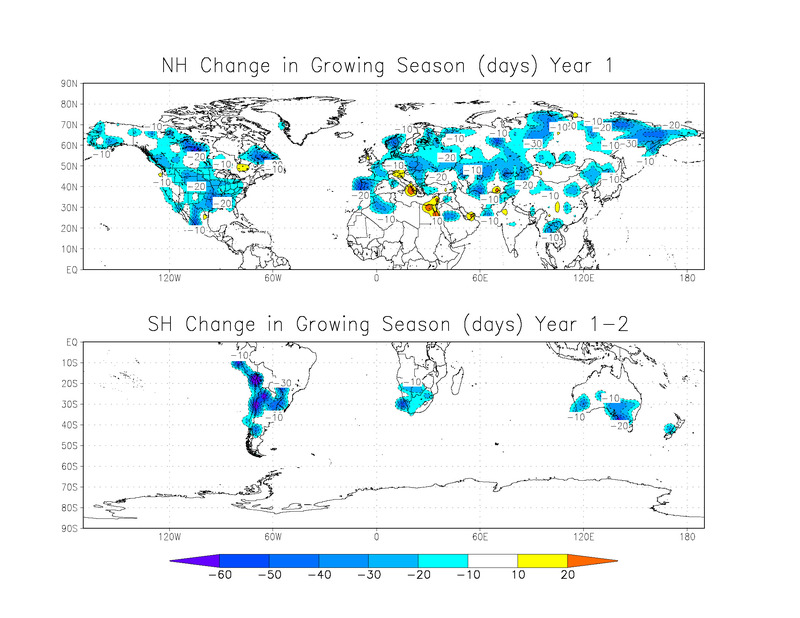 Fig11GrowingSeason.jpg Change in growing season (period with freeze-free days) in the first year following the 5 Tg standard case smoke injection. Figure drawn by Luke Oman. Hansen, J. E., et al., 2001: A closer look at United States and global surface temperature change, J. Geophys. Res., 106, 23,947-23,963, doi:10.1029/2001JD000354. Mann, M. E., R. S. Bradley, and M. K. Hughes, 1999: Northern Hemisphere temperatures during the past millennium: Inferences, uncertainties, and limitations, Geophys. Res. Lett., 26, 759-762. This work is partly supported by the U.S. National Science Foundation grants ATM-0313592, ATM-0351280, ATM-0730452 and AGS-1157525, and the Open Philanthropy Project.